Golf Genie web site. If you’re serious about business and serious about competing, you already know that golf ranks second to none when it comes to creating business relationships that flourish. Golf Genie understands the business of golf. They think strategically, they stay calm under pressure and focus relentlessly on quality and detail. Golf Genie will create a truly memorable Corporate Golf Day, stage a supremely effective Charity Golfing Event or make Corporate Golf Travel headaches disappear. 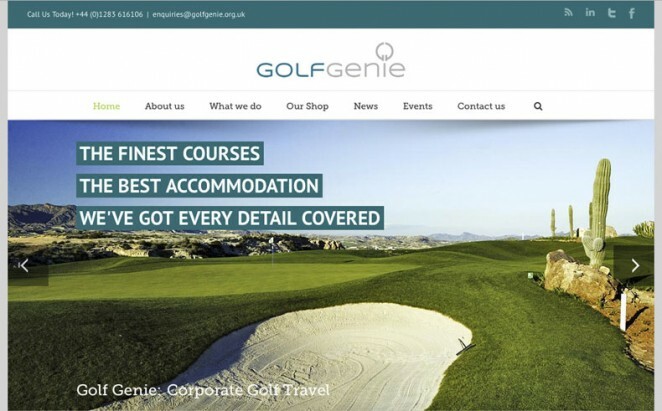 The Golf Genie web site is fully responsive, with layer sliders and parallax effects, has areas for events, news and merchandise and of course, explains exactly what Golf Genie has to offer.